A group of crows is a murder. A bunch of lions hanging around is a pride. So what do you call a group of beastly, ghostly, ghoulish things all packed into one place? A consternation, of course. 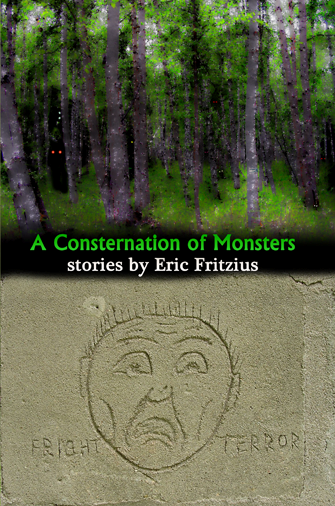 In this short story collection Eric Fritzius introduces us to a whole host of supernatural creatures, some more monstrous than others. In fact, he does a really good job of weaving in stories full of humor and cleverness among the more serious and terrifying. It would be easy for a collection of monster stories to devolve into variations on the same them. Fritzius studiously avoids that. In fact, my favorite story in the collection is a funny one, “. . . to a Flame,” which stars (although that’s not the right word) one of West Virginia’s native monsters, Mothman. Particularly, it involves a local who accidentally kills one. There are problems of disposal and the lurking possibility of a visit from Men In Black, but the heart of the story, for me, is the conversation between the shooter and the narrator in which the shooter goes to great lengths to explain his error. My other favorite is less directly funny, but has a bit of comedic irony at its core. In “The Wise Ones” we meet an old woman and her dog who are, naturally, not quite what they seem. The story works so well because this mystical woman, when stripped of her powers, is still clever and ruthless (and, one suspects, has a killer sense of humor). A pair of stories, “The Hocco Makes the Echo” and “Puppet Legacy” involve the same character in a different way. Aaron is a child in “The Hocco . . .” when the titular beastie makes its appearance. Then in “Puppet Legacy” we see an older Aaron who discovers a monster of an entirely different type in his own family. It’s interesting to see the two stories play off against each other. Add to all that stories about the real fate of Elvis, the strangest boating disaster you’ve ever heard of, and a wolf with a view of some very human monsters and there’s a lot to sink your teeth into here. It being a short story collection some stories work better (as I’ve said before) and some just don’t land, but the ratio of what worked for me versus what didn’t was very high. A Consternation of Monsters is well worth the time if you like weird tales filled with weird creatures. Just don’t read it alone with the lights off! ← Moore Hollow Monday: Win a Free Copy!